In November, 2011, my brother Shaun and his wife Katie were expecting a baby, their second. We were all excited to see their little family growing. Somewhere along the line something happened, and we got the news that Katie had gone into premature labor. She was 21 weeks along when baby Elizabeth was born. She was so small, she did not survive the birth. Elizabeth’s birth caught all of us by surprise. Her passing was even more of a shock. My Carolyn had passed away just three years earlier. Elizabeth’s passing reminded me in so many ways of my own experiences not so long before. My heart went out to Katie especially. Though I don’t live near the rest of my family, I knew I had to do something to help. 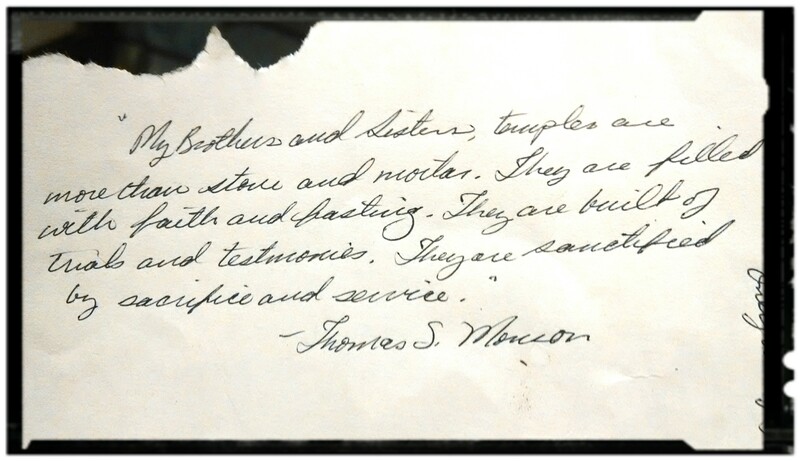 I am one of ten brothers and sisters, and we are all close. As soon as word got around about what was happening, everyone sprang into action, meals, babysitting, anything and everything that could be done was done. Being isolated from everyone during this time was hard, but as I sat and pondered what I could do, I thought about my lace. Elizabeth’s funeral was to be in just a few days. I had less than a week. What was needed? What could I do? How could I help? California law at that time categorized children who died before 20 weeks as miscarriages, and after 20 weeks as stillborn. Elizabeth was stillborn. The state issued a death certificate, and added a bit of formality to this little life. She was given a name and a blessing, but instead of preparing for her life, we prepared for her funeral. My eyes rested on a baby bonnet I’d made recently. 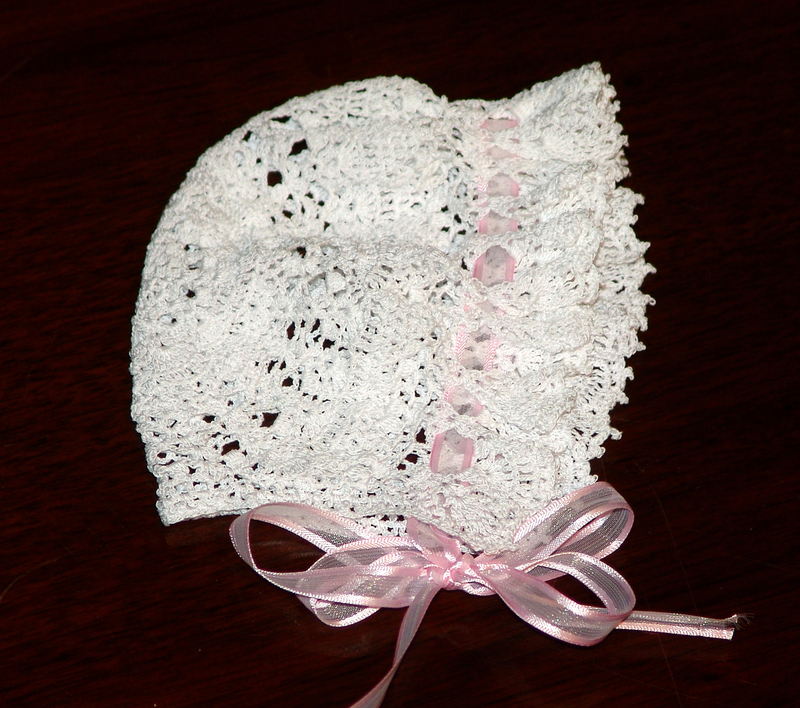 It was my second bonnet, and it was beautiful, but it turned out too small for any baby I knew. As I looked at it, I thought of Elizabeth, and how she, being so young, was very, very small. An idea began to form. Troy’s mother was in town with me, and we came up with an idea. I showed Mary the baby bonnet, she had the same thought I did. It could be for Elizabeth. I’d made blessing dresses and other things for larger, full term babies, but for this tiny preemie, I had no idea what size to make things. I decided to just start, and as I did, ideas came. My brother Shaun was making the tiny casket. My mother and sister worked on the inside, lining it with some of my sister’s wedding dress material. What would a baby that small wear for burial? My mother supposed they’d just wrap her in a blanket. She was so small, too small for anything else. 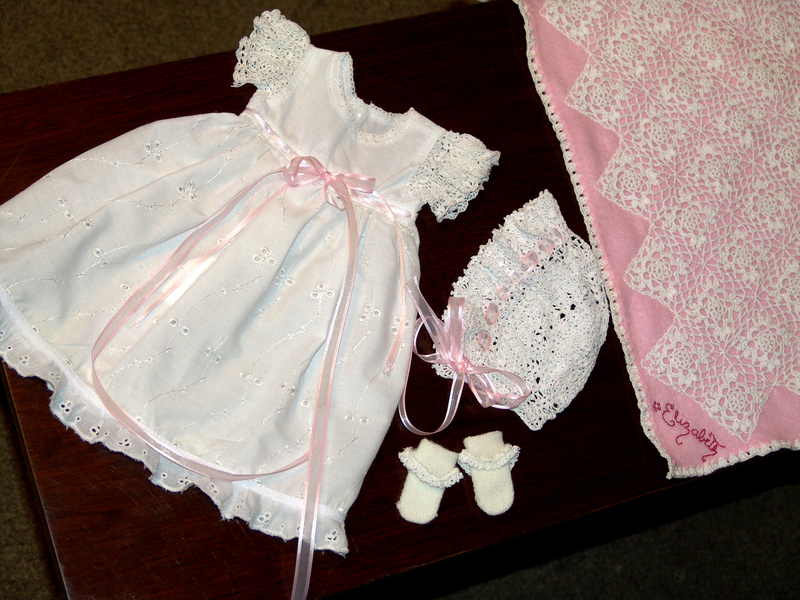 Most doll clothes were too bright and rough cut to be appropriate for such a special purpose. There were resources online, but there was not enough time to order something. Besides, we wanted it to be more personal than that. We had a bonnet, and we wanted a dress to match. After some searching, we found a simple white slip for a doll dress we hoped would work. I modified it with a large enclosure on the back and tailored the dress to the size described by one of my sisters who had seen Lizzie at birth– her head was the size of a woman’s closed fist, and her shoulders were smaller across than the width of her mother’s hand. My heart ached visualizing that scene. How could anyone be so tiny? Everything we put together, we made adjustable for size. I’d never made baby clothes so delicate before, but the dress turned out beautifully. I added tiny thread crochet lace for the sleeves and collar to match the bonnet, and made the waist adjustable with a matching pink ribbon. Mary and I cut two fingers from a child-size white knit glove, and edged them with lace for foot coverings. Mary and I both worked on Lizzie’s blanket. It was lacy, like an altar cloth, but with a pink flannel layer underneath to protect her delicate skin. We threaded a pink ribbon through the bonnet edge to make it adjustable for Lizzie’s little head. 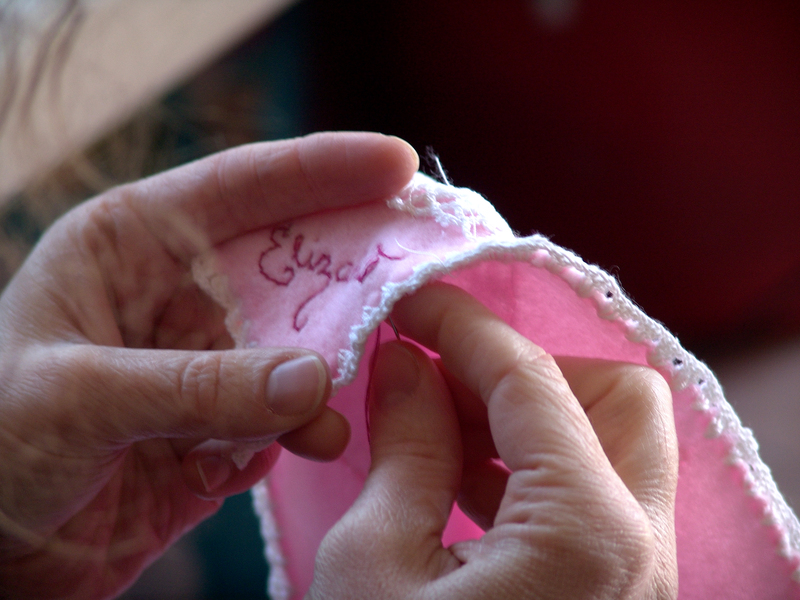 Mary Jo Stegeby, another lacemaking friend of mine, came over and embroidered Elizabeth’s name and date on the corner of the blanket. Mary Jo and I had both suffered the pain of childlessness, we knew loss, and how much the care of others meant to us when we went through those times. This work had our hearts in it. Everything was so small, and so beautiful. Because of other issues, the lace we made wasn’t used in the actual burial, but my sister has it wrapped in a special box, as a keepsake of hers. Elizabeth’s life was so short, and she came so unexpectedly, Katie has few things of hers to remember her by. Our work was a gift she treasures and keeps, until they meet again– a reminder of the promise that this baby is hers, loved, eternal, and death doesn’t last forever. “When we were preparing for Katie’s and Shaun’s graveside service for baby Elizabeth, I looked and looked for a hymn or primary song that talked about the resurrection of little children. There are none, except for one hymn on page 299 that came close, but the tune and words were very unsatisfying to me. So Aunt Janetta suggested that I write a verse to use… which I did. Its an add-on to verse one of “I Wonder When He Comes Again”. I wonder when He come again, will herald angels sing? Will earth be white with drifted snow, or will the world know spring? I wonder if one star will shine far brighter than the rest. Will daylight stay the whole night through? Will songbirds leave their nests? Our Heav’nly Father knows and sees, the smallest sparrow fall. His plan is for our happiness; He loves and cares for all. I know when Jesus comes again, the righteous dead he’ll raise. With joyful voice the glorious throng will shout and sing his praise. Will parents joyfully embrace their small ones once again. Everyone has times of hard trial in their lives. The Lord is good to each of us during these times. Elizabeth’s life was short but there was beauty in it. We all banded together and sorrowed together. How wonderful it is to know, that as hard as these things are to travel through, this time doesn’t last forever. Until we meet again little Elizabeth. Mary working the last square of the blanket lace. 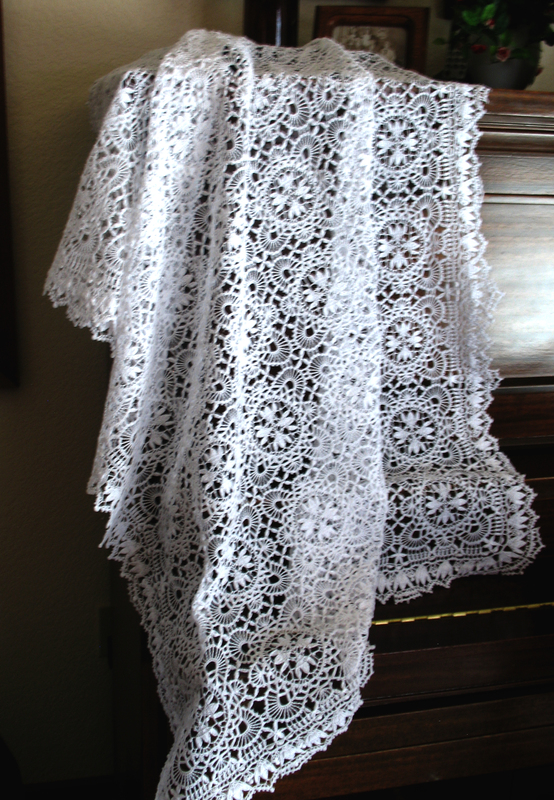 This lace was made by my Mother-in-law, Mary Rockwood, using a pattern I designed with Linnaea Borealis blossoms in the center. 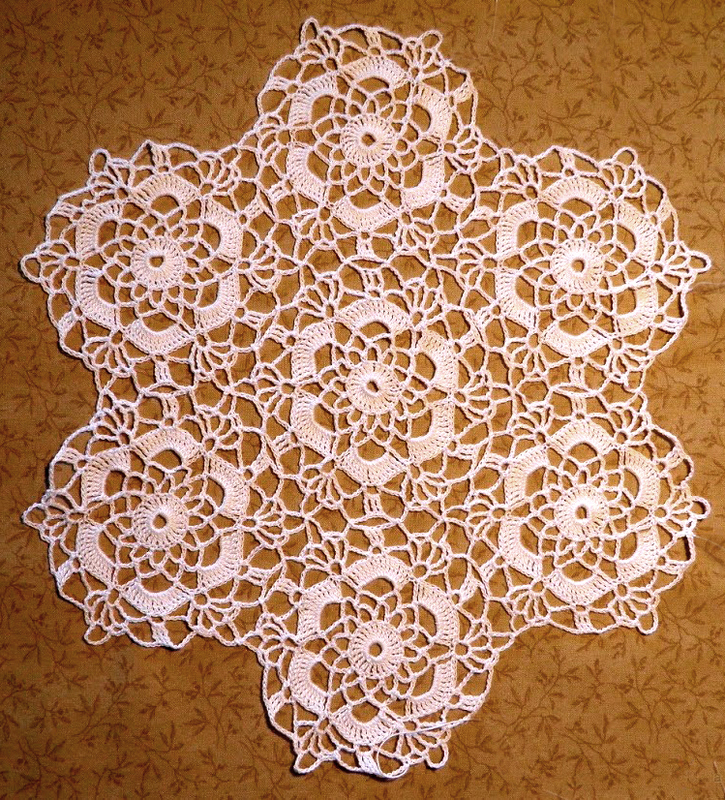 She made this altar lace for the Denver Temple in Colorado. It was completed a few months ago and is now in use there. It is a unique pattern, only two exist, hers and mine. Sister laces. “Just over a year and a half ago my Relief Society president announced the call for altar cloths for the new Payson Temple, which is just on the other side of our ward boundaries. I have a strong pioneer heritage on both sides of my family and many of them contributed to the work of building temples, so I jumped at the chance to make my own offering for the house of the Lord. Little did I know what a huge and wonderful undertaking it would be. Before starting this altar cloth I had limited experience with crochet. I’d made a few hats and scarves, but that was it. The Relief Society President gave me a packet of seven approved patterns and I chose the one I thought was best suited to my abilities, the Daisy Lunch Cloth. Because I was so new at this endeavor it was essential that I follow the pattern exactly. There were times I thought I knew better than the pattern…but I didn’t. It wasn’t until I humbled myself enough to really study the instructions that I gained an understanding of how to be successful with each motif. I had a moment of inspiration and felt the Spirit reminding me that the scriptures and the words of the prophets are the pattern for our lives. Disregarding the pattern only brings frustration, especially as one who is learning and growing. Even more touching to me than that lesson was the renewed testimony of the Atonement. I made many, many mistakes in the process of completing the altar cloth. With every mistake I ripped out the work I’d done and changed my stitches to fix the problem. Now there is no evidence that those mistakes were ever made but there is a complete and flawless whole. The Savior does the same for us when we turn our mistakes over to Him for healing and grace. 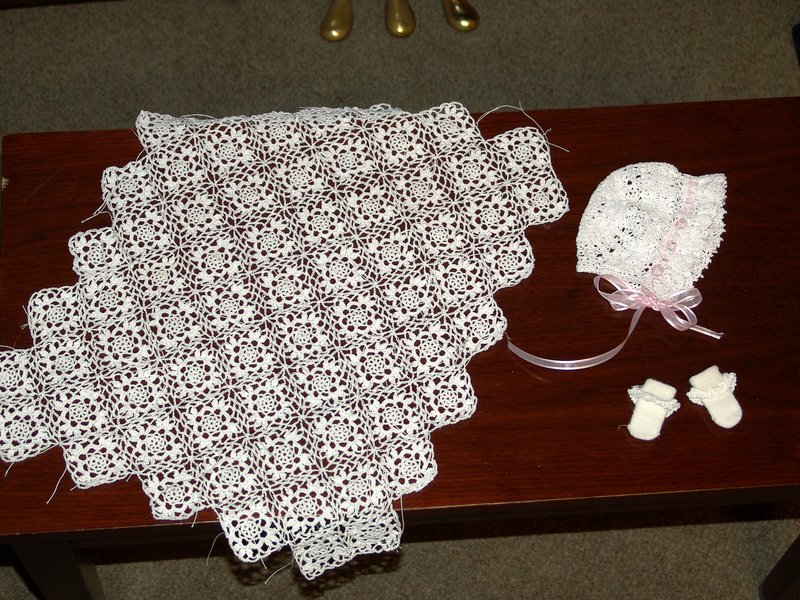 I did not expect my testimony to be strengthened by crocheting an altar cloth but I am grateful for the experience. I came across this today as part of the celebrations going on for Pioneer Day. Not only does it show gorgeous footage of the Salt Lake Temple interior, but also some of the heart, detail, and craftsmanship that go into these temples. The Salt Lake Temple pictured here took 40 years to build and finish. This temple was the third temple the saints began. Both previous temples had been burned and destroyed by people who were set on chasing the people from their towns and faith. I can imagine the joy those saints felt as the angel Moroni was placed, and the beautiful Salt Lake Temple was finally completed. A note of interest, one of my husband’s grandfathers, Albert Perry Rockwood, was in the wagon with Brigham Young on July 24, 1847, the day they first made it to the Salt Lake Valley. After so much suffering, death, and brutality the saints endured searching for a place to live together in peace, it was a great moment when Brigham Young saw the valley, recognized it, and declared “This is the right place”. Pioneer day is celebrated as an official holiday in Utah, but is also celebrated in many surrounding states in honor of pioneers of all faiths who settled the West. Today marks 167 years since our pioneer forefathers came to Salt Lake. 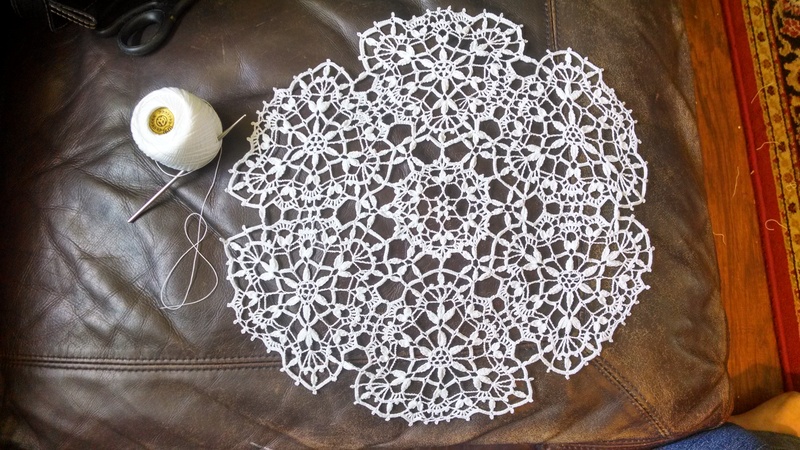 This gorgeous lace is from Marla, a tatting and crochet lacemaker in Boise, Idaho, who contacted me recently about patterns. She found a picture online of what she liked, and recreated it without a pattern. Saving an older pattern from extinction is a great idea! She’s calling it “Deseret Rose”, because it reminds her of rosettes. With older lace patterns, you sometimes can’t find the original. Often lace patterns in the old days were passed from sister to sister with samples rather than written words. I have a sample binder in my lace collection that has notes and bits from my previous projects. It’s a great way to remember what you did before in case you want to do it again. Writing patterns out can be difficult. I always save a sample of my laces, that way if the pattern is lost, you still have it. 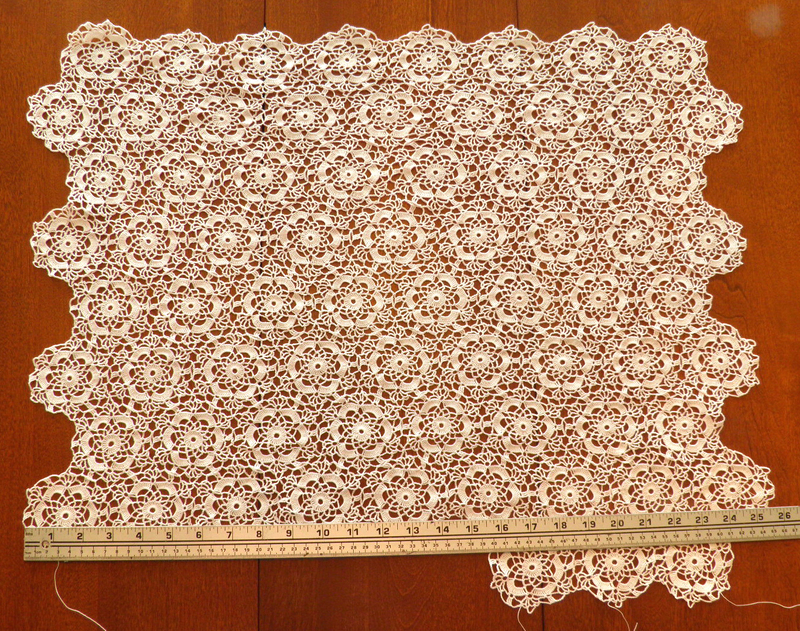 This pattern is a good one for altar lace because it is light and airy without being fragile. It has a lot of connections, not a lot of large holes, and it’s beautiful. It also has a nice gentle scalloped edge which I personally like quite a bit. 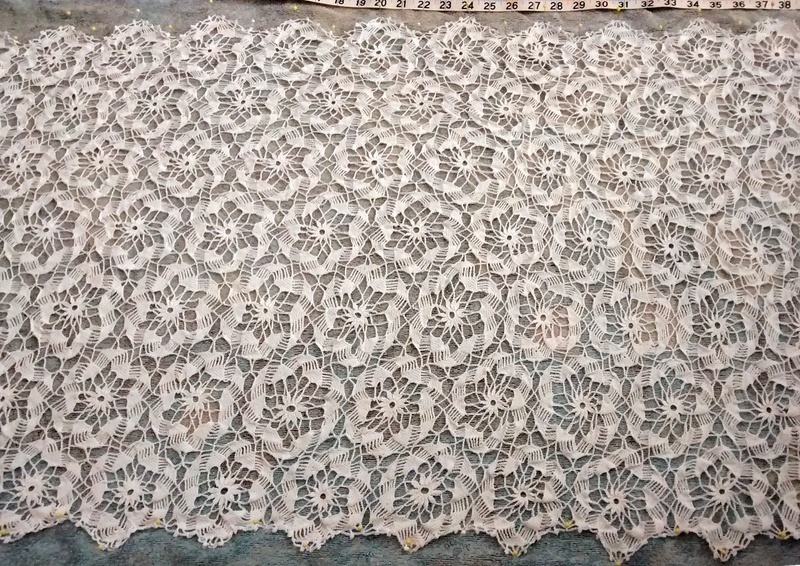 This is an unfinished lace, when it is washed and blocked, it will be stunning. It’s already gorgeous. Beautiful! Blocking a piece of lace really changes the way it looks. 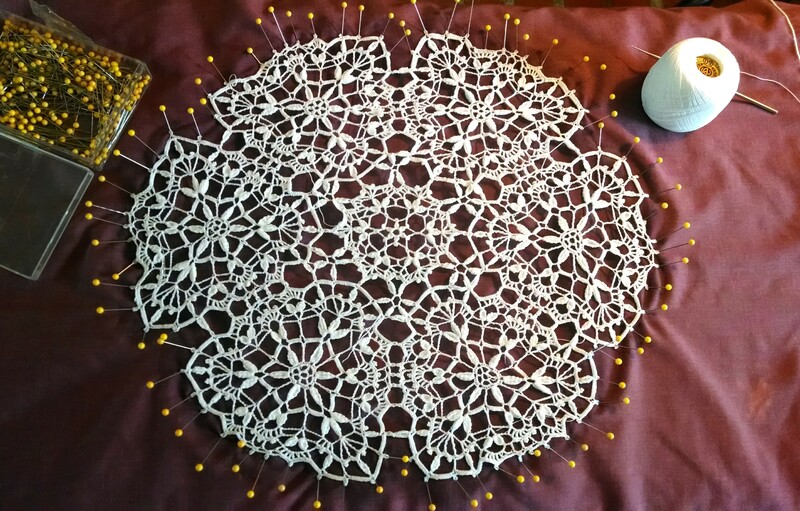 This is my recent lace project, unfinished. Wash the lace in hot water. 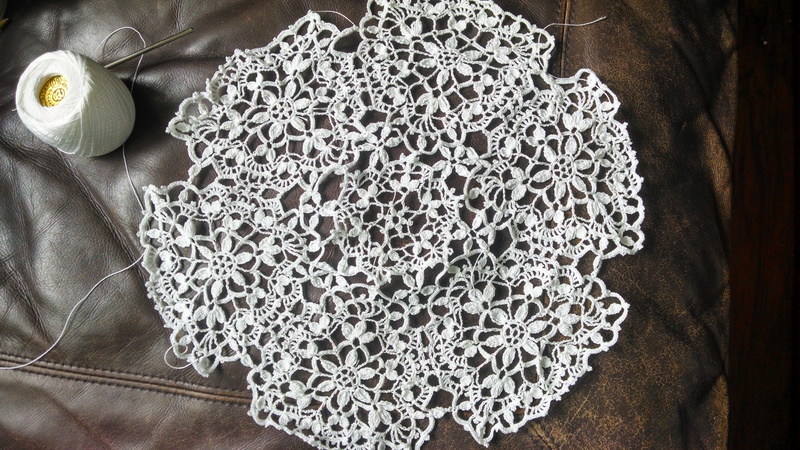 I wash my lace by hand, with a little liquid dish soap in running water for 2-3 minutes, then rinse in hot water. I wrap the wet lace in a clean dry towel and firmly squeeze the excess water from the lace. I never twist wet lace. Next I lay a clean pillowcase over my ironing board to protect the lace and keep it clean while it is drying. 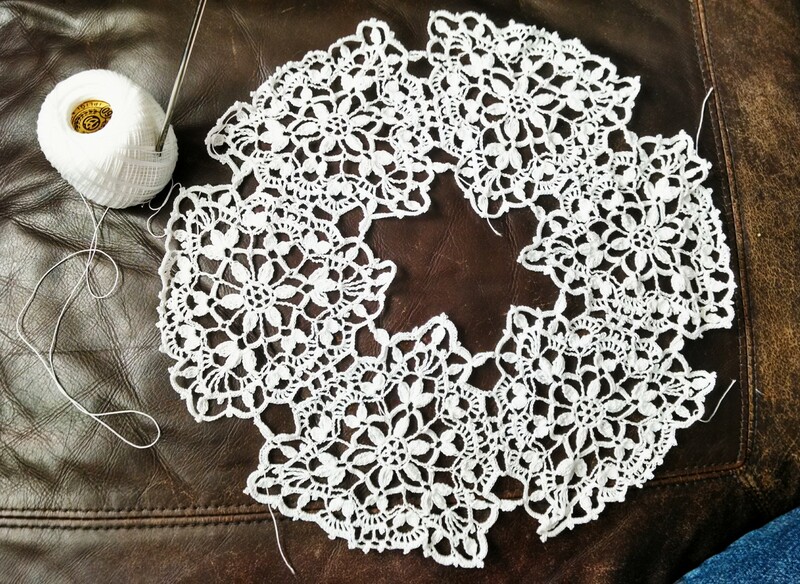 I pin the edges, gently stretching the lace as I go, until the entire thing is molded to the shape I want and stretched out to snowflake precision. When the lace is dry, remove the pins. Voila! 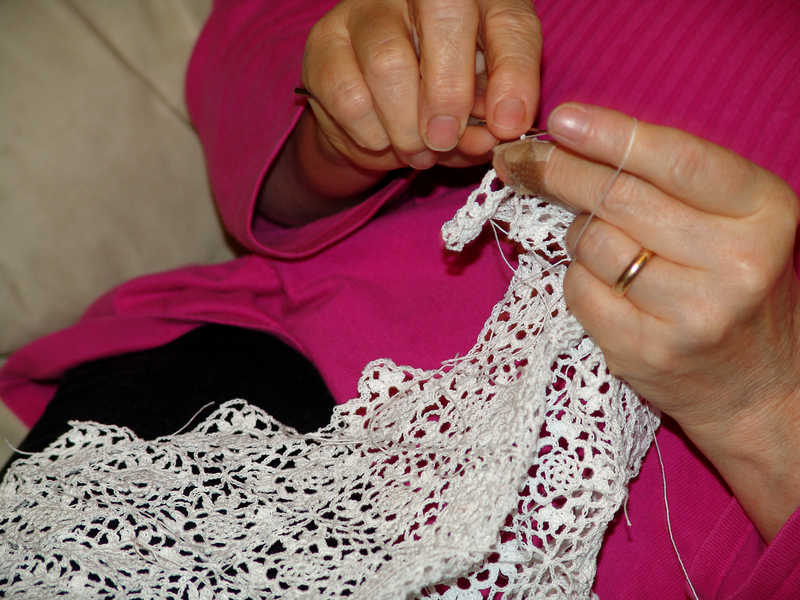 The lace will hold its shape without pins once it is dry. Birds in Flight : It’s coming together!